General of the Armies John Joseph “Black Jack” Pershing (September 13, 1860 – July 15, 1948) was a senior United States Army officer. His most famous post was when he served as the commander of the American Expeditionary Force (AEF) on the Western Front in World War I, 1917–18. 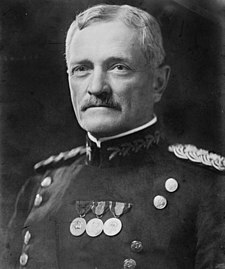 Pershing rejected British and French demands that American forces be integrated with their armies, and insisted that the AEF would operate as a single unit under his command, although some American divisions fought under British command, and he also allowed all-black units to be integrated with the French army. Pershing’s soldiers first saw serious battle at Cantigny, Chateau-Thierry, Belleau Wood, and Soissons. To speed up the arrival of the doughboys, they embarked for France leaving the heavy equipment behind, and used British and French tanks, artillery, airplanes and other munitions. In September 1918 at St. Mihiel, the First Army was directly under Pershing’s command; it overwhelmed the salient – the encroachment into Allied territory – that the German Army had held for three years. For the Meuse-Argonne Offensive, Pershing shifted roughly 600,000 American soldiers to the heavily defended forests of the Argonne, keeping his divisions engaged in hard fighting for 47 days, alongside the French. The Allied Hundred Days Offensive, which the Argonne fighting was part of, contributed to Germany calling for an armistice. Pershing was of the opinion that the war should continue and that all of Germany should be occupied in an effort to permanently destroy German militarism. Pershing is the only American to be promoted in his own lifetime to General of the Armies rank, the highest possible rank in the United States Army. Allowed to select his own insignia, Pershing chose to use four gold stars to distinguish himself from those officers who held the rank of General, which was signified with four silver stars. After the creation of the five-star General of the Army rank during World War II, his rank of General of the Armies could unofficially be considered that of a six-star general, but he died before the proposed insignia could be considered and acted on by Congress. Some of his tactics have been criticized both by other commanders at the time and by modern historians. His reliance on costly frontal assaults, long after other Allied armies had abandoned such tactics, has been blamed for causing unnecessarily high American casualties. In addition to leading the A.E.F. to victory in World War I, Pershing notably served as a mentor to many in the generation of generals who led the United States Army during World War II, including George Marshall, Dwight D. Eisenhower, Omar Bradley, Lesley J. McNair, George S. Patton, and Douglas MacArthur. Warning: Page using Template:Infobox military person with unknown parameter "honorific-prefix" (this message is shown only in preview). General of the Armies John Joseph "Black Jack" Pershing (September 13, 1860 – July 15, 1948) was a senior United States Army officer. His most famous post was when he served as the commander of the American Expeditionary Force (AEF) on the Western Front in World War I, 1917–18. Pershing's soldiers first saw serious battle at Cantigny, Chateau-Thierry, Belleau Wood, and Soissons. To speed up the arrival of the doughboys, they embarked for France leaving the heavy equipment behind, and used British and French tanks, artillery, airplanes and other munitions. In September 1918 at St. Mihiel, the First Army was directly under Pershing's command; it overwhelmed the salient – the encroachment into Allied territory – that the German Army had held for three years. For the Meuse-Argonne Offensive, Pershing shifted roughly 600,000 American soldiers to the heavily defended forests of the Argonne, keeping his divisions engaged in hard fighting for 47 days, alongside the French. The Allied Hundred Days Offensive, which the Argonne fighting was part of, contributed to Germany calling for an armistice. Pershing was of the opinion that the war should continue and that all of Germany should be occupied in an effort to permanently destroy German militarism.